After a 10-year odyssey highlighted by four velocity-boosting planetary flybys, two asteroid encounters and two-and-a-half years spent in electronic hibernation, Europe's $1.7 billion Rosetta spacecraft finally reaches its target Wednesday, matching orbits with an oddball comet and dropping a small lander to its surface later this fall. While a handful of other comets have been studied during earlier flyby encounters by a variety of spacecraft, Rosetta is the most ambitious such mission ever attempted. It is the first designed to fly in tandem with a comet as it becomes active in the glare of the sun, sprouting tenuous tails of dust and electrically charged ions stretching away into space. That would be a remarkable achievement in its own right compared to earlier missions. But if all goes well, Rosetta will chalk up another impressive first in November when a small lander called Philae separates from the mothercraft and drops to the surface of comet 67P/Churyumov-Gerasimenko. Using harpoons and ice screws to lock itself down in the feeble gravity, Philae will bring a suite of sophisticated instruments to bear on the enigmatic relic, including a drill to collect what amount to core samples of pristine sub-surface material left over from the birth of the solar system 4.6 billion years ago. "When the solar system was forming out of gas and dust, it formed the planets, the one we live on today, it formed asteroids and it formed the comets," Mark McCaughrean, senior scientific advisor with the European Space Agency (ESA) Directorate of Science and Robotic Exploration, told reporters late last year, looking ahead to Rosetta's arrival. "The comets are a remnant, therefore, something we can investigate about the very earliest phases of the evolution and the birth of our own solar system." Ice is of particular interest, because water left over from the formation of the sun and planets provides "great clues to the origin not only of our own solar system, but potentially even life," McCaughrean said. "Because we know that comets also contain organic molecules, the building blocks of even DNA and RNA," he added. "We know that there are amino acids in comets, for example. So comets play a key role in our understanding of the cycle of star formation, planet formation, perhaps life formation." Discovered in 1969, 67P/Churyumov-Gerasimenko circles the sun in an elliptical orbit that carries it beyond the orbit of Jupiter to a point between the orbits of Earth and Mars. The comet measures a bit more than 2 miles across and rotates every 12.7 hours. Scientists believe an encounter with Jupiter in 1959 changed its orbit and moved perihelion -- the closest point to the sun -- inward by some 200 million miles. Beyond those basic attributes, little was known about the comet when Rosetta was launched in 2004. As it turns out, the spacecraft will be exploring a particularly interesting target. Long-range photos of 67P/Churyumov-Gerasimenko taken during Rosetta's approach revealed a strange-looking, slowly-tumbling body with two distinct lobes. Scientists say the "rubber duck" shape of comet 67P/Churyumov-Gerasimenko could the result of a low-speed collision between two previously independent bodies, forming a so-called contact binary. Or perhaps it's the result of uneven heating and sublimation of ices in its nucleus or the gravitational influence of the sun or Jupiter during its formation. "We now know about the shape of the nucleus, we see that it obviously looks like a contact binary," Gerhard Schwehm, former mission manager and project scientist, told CBS News. "Now we have to think about what that means for the landing site selection." But that is forward work. The goal this week is to complete Rosetta's rendezvous, putting the spacecraft in position to accompany 67P/Churyumov-Gerasimenko as it moves into the inner solar system. The comet currently is moving through space at some 34,000 mph. ESA flight controllers have been carrying out a carefully planned sequence of thruster firings since May to reduce the spacecraft's velocity by about 1,700 mph. The goal is to maneuver Rosetta to a point about 60 miles ahead of the comet and slow it to a velocity of just 2.2 mph relative to the nucleus, setting up a complex triangular trajectory. The spacecraft eventually will be maneuvered to a point just 19 miles or so from the nucleus, close enough for 67P's feeble gravity -- 20 millionths the strength of Earth's -- to hold the craft in place. Rosetta carries a suite of 11 state-of-the-art instruments, including wide- and narrow-angle cameras, spectrometers, dust analyzers and other investigations while the Philae lander carries 10 instruments, including high-resolution imager, gas and dust analyzers and a drill that will collect samples up to eight inches below the surface. "We have cameras in the visible, the infrared, the ultraviolet and at millimeter wavelengths to investigate the surface structure and the temperature and the materials the comet's made of by looking from a distance," McCaughrean said. "We're going to measure the particles in the coma, the material flowing away from the comet, we're going to be able to measure the masses, the materials that the gas and dust are made out of that's flowing away." When the Philae lander descends to the nucleus in November, on-board cameras will document the journey, followed by a panorama from the surface "all the way around, 360 degrees, in stereo of the surface and then looking downward, doing microscopy, looking in high resolution at the surface of the comet," McCaughrean said. "We're then going to have a number of little laboratory experiments that will measure the gas and the dust, the organic material and the plasma coming away," he said. "And then we're actually going to drill beneath the surface to look at material just under the surface and melt some of that material, we'll dig (it) up and bring into the spacecraft." If all goes well, Rosetta will actively observe 67P/Churyumov-Gerasimenko through December 2015, monitoring the rise and fall of the comet's activity as it swings through perihelion in August 2015 and back out to deep space. How long the Philae lander might last will depend on the comet's activity and and whether the spacecraft's solar panels remain clear enough to recharge on-board batteries. The highest-priority observations will be carried out in the first week on the surface with a second set of observations planned over the following three months. 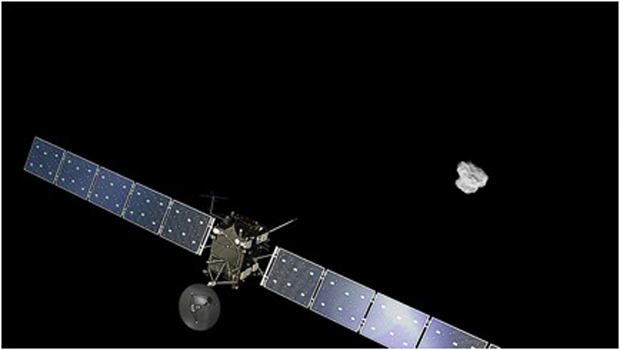 The European Space Agency approved the Rosetta project in 1993. ESA originally planned to partner with NASA for a comet sample return mission "but for different reasons, NASA had to drop out," Schwehm said. "We still have NASA as a partner because we have four PIs (principal investigators) from the U.S.
"So we had to change our plans and go to a rendezvous mission and asteroid flyby," he said. "At that time, we said if you can't get the nucleus back in our laboratories on Earth, we'll send a laboratory to the comet." ESA initially planned to visit comet 46P/Wirtanen, but problems with the spacecraft's Ariane 5 rocket forced a delay and the selection of a different target: 67P/Churyumov-Gerasimenko. Rosetta was finally launched on March 2, 2004. But even a powerful Ariane 5 could not fling Rosetta directly to its target. Instead, flight planners came up with a complex multi-orbit trajectory that included four gravity-assist planetary flybys to pump up the spacecraft's velocity enough to escape the inner solar system. Rosetta streaked past Earth in 2005 and then past Mars in February 2007. After a second Earth flyby later that year, Rosetta flew past an asteroid and returned for a third flyby of Earth in November 2009. The spacecraft flew past a second asteroid in July 2010. But by the summer of 2011, Rosetta was too far from the sun for its huge solar panels to generate enough electricity to power all of its instruments and subsystems. "We came to such a distance from the sun that even our large solar arrays, even our high technology solar cells, were not enough to keep the full spacecraft active," Paolo Ferri, head of mission operations, told reporters late last year. "What we had to do in June 2011, we had to switch off most of the systems, spin up the spacecraft and leave it alone." For the next two-and-a-half years, Rosetta silently cruised along the outer reaches of its trajectory, collecting just enough sunlight to keep itself warm, all the while closing the gap with 67P. Finally, on Jan. 20, 400 million miles from the sun, an on-board timer hit zero and Rosetta woke itself up, turning on its transmitter and phoning home to elated scientists and engineers. Telemetry indicated the spacecraft was none the worse for its long slumber, setting the stage for the final chapter in its 10-year space odyssey. Now, with arrival at the comet just hours away, Rosetta is finally ready to answer 10 years of "are we there yet?" "This time capsule has been locked away for 4.6 billion years," McCaughrean said of Rosetta's comet. "It's time to unlock the treasure chest."